March On Wall Street, originally uploaded by pamhule. 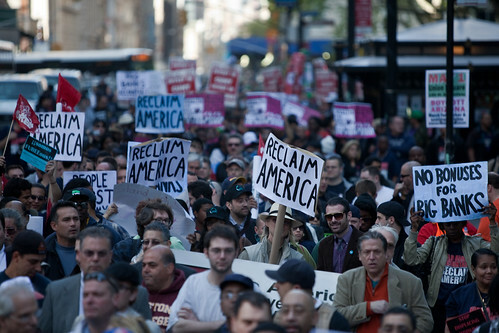 Protesters join the March on Wall Street Rally in New York City on April 29, 2010. I photographed a few more rallies this week. On Thursday I covered the "March on Wall Street" for Talking Points Memo. Their slideshow from the event is here. Organized by the the AFL-CIO, moveon.org and others, thousands of workers and labor activists marched from City Hall down Broadway to protest the banks and the financial sector. I felt I was able to cover the energy of the rally fairly well. You can see all my photos from the rally in this set on flickr. Yesterday I dropped by two more rallies. One was an immigration reform rally downtown organized by the Alliance for Labor & Immigrant Rights and Jobs for All and the other a May Day rally in Union Square that protested a hotchpotch of issues. Arizona's controversial immigration law was a unifying theme in both rallies (see my earlier post on a new documentary on racial profiling). Slideshows of all three rallies are included below. Nice photos from the protests, Jens!